A new report from the University’s Accessibility Observatory estimates the accessibility to jobs by auto for each of the 11 million U.S. census blocks and analyzes these data in the 50 largest (by population) metropolitan areas. Based on this measure, the research team calculated the 10 metropolitan areas with the greatest accessibility to jobs by auto (see sidebar). A similar weighting approach was applied to calculate an average congestion impact for each metropolitan area. Based on this measure, the team calculated the 10 metropolitan areas where workers experience, on average, the greatest reduction in job access due to congestion (see sidebar). “Rather than focusing on how congestion affects individual travelers, our approach quantifies the overall impact that congestion has on the potential for interaction within urban areas,” Owen explains. The report—Access Across America: Auto 2015—presents detailed accessibility and congestion impact values for each metropolitan area as well as block-level maps that illustrate the spatial patterns of accessibility within each area. It also includes a census tract-level map that shows accessibility patterns at a national scale. The research was sponsored by the National Accessibility Evaluation Pooled-Fund Study, a multi-year effort led by the Minnesota Department of Transportation and supported by partners including the Federal Highway Administration and 10 state DOTs. 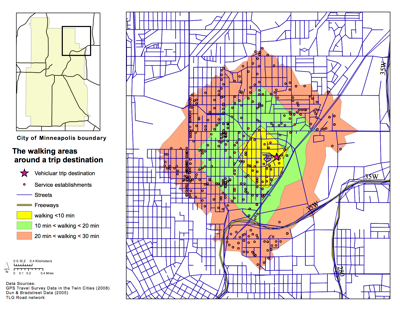 Huang, Arthur and Levinson, David (2011) Accessibility, network structure, and consumers’ destination choice: a GIS analysis of GPS travel data. Anecdotal and empirical evidence has shown that road networks, destination accessibility, and travelers’ choice of destination are closely related. Nevertheless, there have not been systematic investigations linking individuals’ travel behavior and retail clusters at the microscopic level. Based on GPS travel data in the Twin Cities, this paper analyzes the impacts of travelers’ interactions with road network structure and clustering of services at the destination on travelers’ destination choice. A multinomial logit model is adopted. The results reveal that higher accessibility and diversity of services in adjacent zones of a destination are associated with greater attractiveness of a destination. Further, the diversity and accessibility of establishments in an area are often highly correlated. In terms of network structure, a destination with a more circuitous or discontinuous route dampens its appeal. Answering where and why people choose to patronize certain places, our planning, our findings shed light on the design of road networks and clusters from a travel behavior perspective. Arterial traffic available on Google Maps for selected cities (including Minneapolis). It seems they are doing it from Google Maps for Mobile, and getting automatic feedback of location from GPS-enabled online users (and thereby deriving speed). Clearly this is a good thing for traffic data nerds, and critical mass for arterial travel times is a good thing, even if Google winds up being the dominant provider.